Snow fell in darkness leaving a thin blanket of white. The pin oak tree began shedding last year’s foliage indicating warm weather activated new leaf buds and pushed out the old. Seems weird to rake leaves in February. More to the point, it’s not normal. In a couple of hours I return for a fifth season at Local Harvest CSA. The main spring task is soil blocking 72 and 120 cell trays for seed starting in the germination house. Part of my arrangement is keeping some of my own seedlings there. When I’m finished with the farm’s trays, I’ll make one 72 and one 120 tray for myself and seed them with kale, celery and basil. I’m hopeful they will do better than in the south-facing window in our bedroom. Getting my hands dirty with soil is a great way to get ready for spring, three weeks away by the calendar. 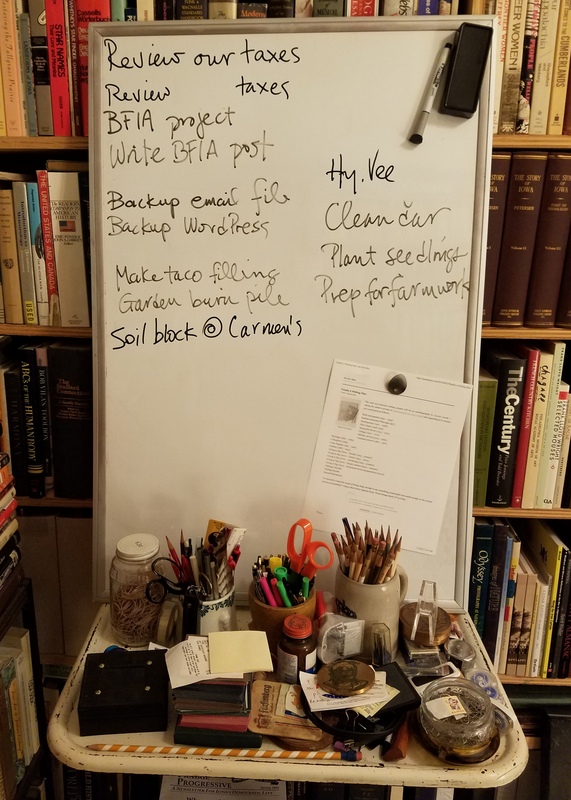 Other chores on my white board include doing taxes, computer file backup, cleaning the car, preparing the garden for spring and Belgian lettuce planting this week (traditionally March 2). I made extra servings of spaghetti with tomato sauce for lunches and want to make a batch of taco filling for breakfast on work days at the home, farm and auto supply store. There’s also more writing projects. During a Climate Reality Project conference call on Thursday, a friend from Waterloo and I decided to work on a project with other friends from Waterloo-Cedar Falls. I’ve done two presentations there and look forward to more meaningful work. We’re planning luncheon, maybe next weekend. This last lap in the workingman’s race looks to be action packed with local food, environmental and cash producing projects coming into focus. Night’s snowfall melting in the sun makes way for budding plants in a grey and brown landscape. It is almost time to wipe the whiteboard clean and begin anew. This entry was posted in Environment, Local Food and tagged basil, Belgian lettuce, celery, climate change, environment, farming, kale, local food, spring, sustainability, The Climate Reality Project. Bookmark the permalink.